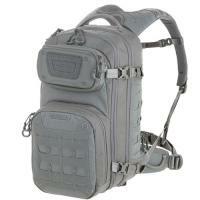 Maxpedition RIFTCORE Backpack FREE SHIPPING! The RIFTCORE Backpack from Maxpedition is a rugged all-purpose pack ideal extended missions, hunting trips or spending a long weekend in the woods. Yolk style backpack straps or meant for heavy loads and distribute weight away from the spine for lasting comfort on long treks. A reinforced waist strap offers added support by further dispersing the pack's weight to prevent injury. A discreet rear pocket is designed for concealed weapon carry and features a loop lined interior for securing holsters. The primary compartment utilizes a clamshell style opening to provide users with convenient access to all of the pack's contents. A loop panel offers a secure attachment platform for securing modular pouches and gear. The backpack itself is made from heavy-duty 1000 denier nylon and features YKK® Zippers to ensure lasting durability that can stand up to the toughest conditions. ©2002-2019 CopsPlus.com: Maxpedition RIFTCORE Backpack FREE SHIPPING!